Some beginners are quite nervous to start Karate: Am I fit enough? Will I get hurt? Will I embarrass myself? First, your level of fitness will be noted by your instructor, who will make sure you do not over-exert yourself. Second, while Karate (like all martial arts and sports) carries the risk of injury, your instructor will take every precaution to keep you safe. Third, no student should feel embarrassed – we were all beginners once! What should I expect at my first lesson? Some aspects of Karate training may seem a little strange on first encounter – people kneeling and bowing; wearing white uniforms with coloured belts; students calling instructors Sensei and saying Oss! 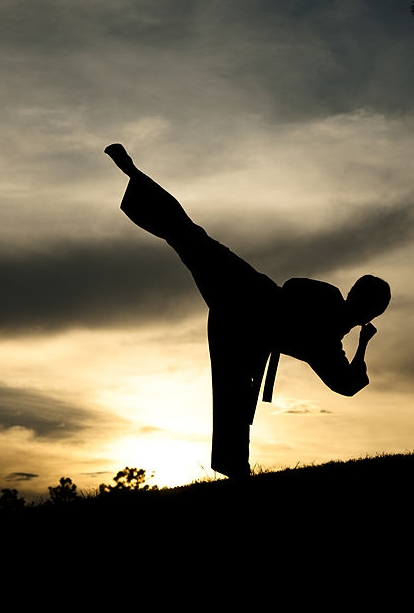 – but these are just some of the characteristics that separate Karate as a martial art from combat sports like boxing and MMA. Of course, beginners are not expected to be familiar with the terminology or protocols, we are here to guide you through all those steps. If you get lost all you need to do is ask your instructor. Karate practise begins and ends with Rei, which simply means respect. In Japanese culture, respect is demonstrated by bowing, in a similar way to Westerners shaking hands. Bows can be performed from Seiza (kneeling) or Musubi-dachi (standing) position. Karate instructors are called Sensei, which simply means the one who went before – that is just to say that they learned Karate before you did. Karate students acknowledge their Sensei’s instructions by saying Oss! There is no need for you to wear a Gi (Karate uniform) to your first lesson – track pants and a t-shirt are quite appropriate. Please remove your shoes before walking onto the training floor to avoid tracking in dirt from outside. Please do not wear any jewellery or watches, as they could be broken or even cause injury during training. Please bring along a drink bottle, as you will be given occasional drink breaks. To get started on your Karate Journey contact us and we’ll get in touch.